This No-Knead Bread has beautiful plump air pockets on the soft, spongy interior encased in a lovely crunchy shell. Are you drooling? Well, you can make it and you really should. No bread machine needed. Just a big bowl and a clean pair of hands, especially those of eager little ones. Making bread the old fashioned way is almost magical, like re-living culinary history. It does require a bit of planning and patience. After dinner tonight, after clearing the table, get the kids to help you start the dough. Then tuck it away for the night and get some shut-eye. By dinnertime tomorrow night, it will be ready to go into the oven and your family will be amazed at your new-found skills as a bread master. 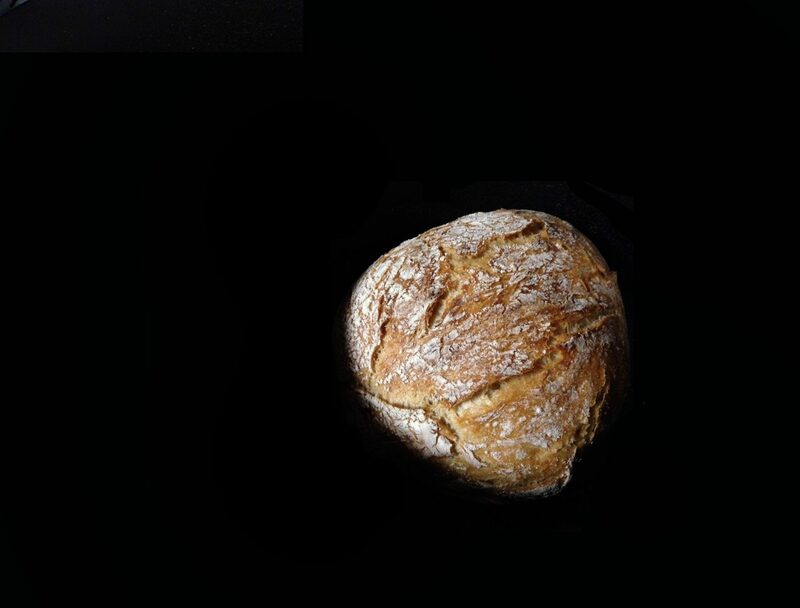 Jim’s original recipe requires no skill, very little effort and produces a rustic French-style boule, a round loaf that resembles a squashed ball, as its name suggests. It’s perfect to make with the kids. The artisanal quality of this no-knead bread will shock you. The only change I made to is the addition of sugar. I also set the radio onto the classical station to serenade the yeast, but this bread turns out fabulous without either. Just don’t be a Colette and forget the salt – it’s crucial to the composition and flavor. Mother’s Day is coming and I’m recounting precious memories with my sweet Daisy. We love to cook and bake together. This No-Knead Bread is our most recent proud moment in the kitchen. I could easily be happy with just a glass of wine, balsamic, olive oil with a few slices for dinner any night. You need this bread in your life. The crunchy exterior gives way to the most delightful spongy interior with big, air pockets, beautiful crumb structure, as Jim says. Most importantly, this bread-making process sets the scene for quality time with the little ones who are always eager to lend a helping hand, especially in the kitchen where the fruits of their labor are most rewarding.